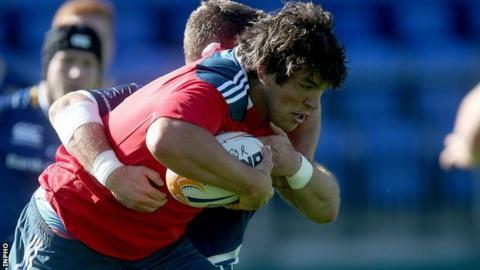 Munster second row Donncha O'Callaghan has been banned for two weeks for kicking Ulster centre Stuart Olding in the head during last week's Pro12 game. O'Callaghan will miss Saturday's European Champions Cup game against Clermont Auvergne and the return fixture in France on 14 December. The 35-year-old was given credit for having not been cited before. "The committee accepted the action was not intentional," said Munster team manager Niall O'Donovan. The incident occurred early in the second half of the match in Limerick. Olding was able to complete the match after leaving the field to receive treatment. Munster beat Ulster 21-20 to move to the top of the Pro12 standings. In October, Toulon lock Romain Taofifenua received a three-week ban for kicking Olding in a ruck during Ulster's Champions Cup pool clash with the European champions at Kingspan Stadium.